America’s No. 1 drain opener. Thickened formula goes through standing water straight to the clog. Dissolves hair and food particles fast. Safe for disposals, septic tanks, plastic pipes. 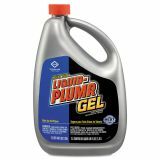 Liquid Plumr Heavy-Duty Clog Remover, Gel, 80oz Bottle, 6/Carton - Liquid-Plumr Heavy-Duty Clog Remover provides a powerful, fast-acting solution for both fully clogged and slow-running drains. This ready-to-use formula works on a variety of clogs caused by hair, food soils, grease and other materials that slow drains. Liquid-Plumr Heavy Duty Clog Remover is safe for disposals, septic tanks and plastic pipes. 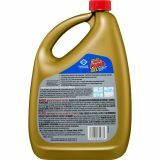 From Clorox Commercial Solutions, this drain cleaner is ideal for use in offices, schools, daycare centers, restaurants and other commercial restrooms.